Since its inception, the Mazda 3 has been a fun, affordable and fuel-efficient car that stood out for its driver-focused experience. The all-new 2019 Mazda 3 has the challenge of pushing that fun and engaging experience into a premium space, and it’s pretty much hit it out of the park. I’ve spent a lot of time in the outgoing generation of the Mazda 3. My folks have owned a base front-wheel drive manual Mazda 3 for years, and I enjoyed driving it so much there was a period in college where I dumped my leased Ford Focus on them to keep the 3 for myself for a few months. Every time I visit them, I still can’t wait to take the 3 out. It has a certain quality of what I call “flingability,” where you can rev it out, row through the gears, and steer it into a corner and it feels like it comes alive. The body rolls into corners with an initial lurch but catches itself, the engine note isn’t particularly sporty but is still satisfying, and the clutch and shift throws are light and easy to master. Instead of feeling like it’s taking abuse, it seems engineered for that sort of driving. But the steering wheel on that car has a spongy, rubbery texture. The controls are brittle plastic dials, and there’s a lot of greyish-black hard plastic surrounding the occupants. The road and wind noise is noticeably grating, and beyond the spirited character, there’s not a lot about the car feels particularly special. Granted, my parents opted for the cheapest manual they could find, but the car has definitely fallen behind in material quality compared to the other newer compacts in the market like the Honda Civic, Toyota Corolla or even the Hyundai Elantra. But things are different now. The all-new Mazda 3 is the first car built from the ground up to fit into the company’s plan to catapult itself into being a more premium automaker. Mazda’s far smaller than rivals like Toyota and Honda, so bigger profit margins by making the cars more upscale is the way it’s headed. But even the new Civic and Corolla, while bigger than ever, are better to drive than they’ve been in a long time. As such, the Mazda 3 had to up its game. The car keeps a manual transmission option, adds all-wheel drive, and it will eventually get the company’s fancy new “holy grail” Spark Controlled Compression Ignition engine. 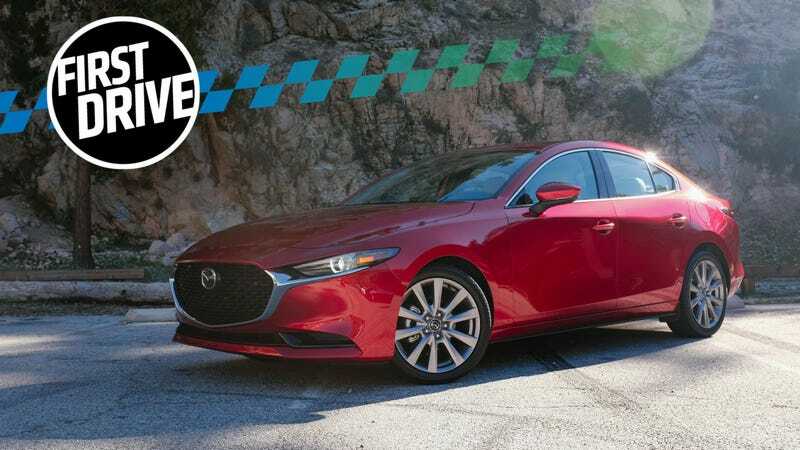 But Mazda wanted to cover the basics with this first drive test, putting me behind the wheel of a front-wheel drive sedan and covering the fundamental philosophy behind the new 3’s fresh platform. The old car fully exemplifies the slow-car-fast philosophy, and it’s for that reason Mazda’s move toward being more premium was initially alarming to many of us. Plus, Mazda tells us Mazdaspeed is dead, that the company has to focus on a more efficient and electrified future, and that it wants to appeal to a broader group of customers beyond those settling for a fun, but affordable deal. So can this matured version of the Mazda 3 find a balance between the charming driving character of the outgoing car, and still be more accommodating to a buyer looking for a more premium experience? That’s what I aimed to find out. In the U.S., the new Mazda 3 will only be available with the 2.5-liter SkyActiv-G engine, which produces a claimed 186 horsepower and 186 lb-ft of torque. The 2.5-liter engine becoming standard on the new car is probably a big reason for the starting price bumping up to $21,000 for the front-wheel drive sedan. You can see the full pricing breakdown in our article from earlier this week. Both the sedan and hatchback are offered with all-wheel drive now, too. But the biggest takeaway is that the manual transmission is only available on the premium-trim front-wheel drive hatchback model—for now. The sedan starts off with 16-inch wheels and cloth seating and door trims standard, and the hatchback starts off with 18-inch wheels, Apple CarPlay and Android Auto, leatherette seating and door trims, dual-zone climate control, rain-sensing wipers and keyless entry as standard. You can see why the hatchback starts $2,600 pricier than the new sedan. You’re reading about cars on the internet, so you’ve probably seen one of Matt Farah’s One Take videos where he basically runs through Angeles Crest Highway just outside of Los Angeles, and then turns around. That’s almost exactly the amount of time I had driving the new Mazda 3 front-wheel drive sedan, on exactly those roads, for just under an hour total of non-traffic driving. While we’re eager to do a more comprehensive test soon, I’ll give you everything I could get from this short drive. Getting into the new car, the first thing I noticed is the steering weight. While the new Mazda 3 does come with a Sport setting that you can switch on or off, the setting only changes the transmission mapping—it doesn’t change the steering feel nor the suspension setup. Mazda claims those two other things are already optimally tuned for enthusiastic driving. For years, people have been asking automakers to build a car the way the engineers want it to be driven—save us from the endless menus and options of infinitely variable sport and sport-plus settings for every aspect of the car. Mazda has done that here. The result is that the steering is heavy. It feels closer to an old car with no power-assist than most new racks do. It’s remarkable. And just like those old steering setups, as soon as you’re at any considerable speed, the steering feels appropriately weighted, tight and responsive. Mazda claims it’s fundamentally the same steering gear underneath as the outgoing car, but it’s definitely been tweaked and tuned. It may throw some people off, but I ultimately appreciated it, as it holds to Mazda’s philosophy of the driver having a consistent understanding of the car’s every function. In Los Angeles traffic on the way to the canyons, all I really deduced was that the new rear torsion beam suspension handles potholes very well, and that it was anything but harsh or wiggly. More on the torsion beam suspension in a bit. I also noticed that the car noticeably carries its speed, in a strange and almost alarming way. A Mazda engineer told me they all wished they could have worked in more engine-braking (for the automatic), but that efficiency ultimately had to rule the day. The better average speed with minimal acceleration and deceleration they can manage, the more efficient the car is. It’s good that the brakes work well. In the canyons, though, it was almost alarming how little impact lifting off the throttle had. I felt like I was rushing to brake a little quicker than usual, but it was easy enough to adapt to. Just a few raised eyebrows on my corner-entering speed. Gone is the car that lurched into corners and felt almost too light on its, well, wheels, but the new experience is still extremely satisfying. The new 3 feels much flatter and stable in cornering, the steering is predictably manageable, and the new tires—which were specifically chosen to be softer, to take more of the initial impact vibration of bumps in the road—never threatened me with understeer. I was a little worried all of the talk about minimizing the physical impact of road bumps and wiggles on the driver’s body would diminish the actual feedback you’d want from the car, and maybe that was happening a little bit. Never once did I have to brace with a knee against the door, my hands were never tense around the wheel, and my shoulders weren’t shifting around too much. All of that was nice from comfort perspective, and maybe helped me better manage my throttle and steering inputs and focus on the road—again, Mazda’s goal was consistent control and feedback between the driver and the car—but it did diminish just a bit of the rawness and flingability-feeling I mentioned of the outgoing car. The automatic in “manual” shifting mode is fairly responsive, but the translation of the gear shifts through fairly small plastic paddle-buttons behind the wheel don’t make the shifts feel Porsche-PDK-dramatic. However, you should really relax if that’s what you’re asking of the Mazda 3. It was quick, just shy of really quick. It was fine. If I left the automatic to do its own bidding, it did well as I flung the car around. With me in control, I struggled between when to shift down to second from third, but I also didn’t know the roads, so I couldn’t map out my corners. It was mostly what felt right for the corner ahead, but it definitely led to some awkward shifts on my part, when the corner ahead suddenly became a series of corners. The automatic pretty much just kept it in third gear, and I think it was better for it. There was still plenty of torque to accelerate through. It definitely seemed like the car knew what I was asking of it and rose to the occasion. An hour on Angeles Crest roads is a good time, but it’s definitely not nearly enough to definitively come back with a full verdict about the new 3. Especially when I’ve yet to drive the hatchback, or the manual, or the all-wheel drive models. Mazda already has plans for more seat time coming up, so we’ll have a lot more to say soon enough. After spending some time in the new 3, it’s no question that the material quality of the car has vastly improved over the outgoing generation. Mazda’s roadmap to premium started with the refreshed 2018 Mazda 6, but the new Mazda 3 is the first all-new car to debut under its new initiative. Its new platform will be the foundation of upcoming model replacements, and maybe even a few all-new models, according to a few wink-eyed teases from the Mazda team. The focus was on improving interior sound quality—both minimizing road and wind noise, and improving the audio system quality—as well as ironing out ride quality and handling, improving interior materials, and bending the traditional rules of the compact segment to make the car look lower and sleeker. All of that feeds into the most immediately noticeable change to the new Mazda 3: the starting price jumped from $18,095 in 2018 to $21,000 for the 2019 model year. Mazda approached its clean-sheet SkyActiv Vehicle Architecture platform design with noise in mind, working hard to minimize the amount of holes in the body, as well as limiting unwanted vibration and movement. Mazda claims it even limited the amount of holes in the floor carpeting. There’s also more sound deadening material in the headliner and floor mats, all in an effort to minimize high-frequency sound from entering the cabin. One of the more interesting changes was removing the low-frequency bass speaker from the lower door panel, where it’s often found on many cars, and instead placing it behind the dashboard in the structure of the body. This is meant to limit unwanted door vibration with the volume turned up, and it seemed to work in the stationary audio demonstration we were given. Much of the intended minimized road noise comes down to the all-new platform, too. Mazda’s goal of improving interior sound quality was directly related to its mission to improve the overall ride quality of the car, minimizing vibration and smoothing out bumps. A lot of that vibration, and thus road noise, Mazda claims, came from the outgoing car’s independent rear suspension. This is the justification for the controversial switch to a torsion beam setup in the back of the new car. This was controversial because, traditionally, torsion beam suspension setups are typically associated with being a cost-saving option for non-premium vehicles—cheap compacts and the like. Mazda currently uses a torsion beam rear suspension on its Mazda 2 and CX-3. But the new Mazda 3’s suspension is allegedly totally different. The company is actually seeking a new patent for its design—the transverse beam expands wider from the center, and is 75 percent laterally stiffer than what you’d find on the CX-3. It also uses a different bushing setup to improve vibration and noise reduction. The company claims it can be refined and tuned better, as well, to maintain and even improve upon the driving characteristics of the outgoing independent rear suspension, and it allows for more rear-seat and trunk space. The benefit of it all is supposed to be the reduction of pivot points and moving parts like you’d find with an independent rear suspension, which Mazda found to be a big cause of the outgoing car’s road noise issues. The new setup is also supposed to help stabilize the car over bumps and produce a linear, more “natural” impact feeling for passengers. Mazda seems to think it’s found a simpler solution with minimal trade-offs. That, coupled with a new seat design meant to improve passenger posture and further reduce road impacts, is meant to offer a smoother, more comfortable and quieter ride experience. The new seats are meant to put a person’s spine and pelvis in a walking position, which Mazda believes helps the brain subconsciously stabilize the head as the car turns and takes bumps, like it does with the impact of your legs walking beneath you. Mazda even showed us videos of head movement over a speed bump in the new car compared to the old, and there was consistently a more visible impact from the old car. The final major update over the old 3 is the overall material quality of the interior. Of course, Mazda only had Premium-trim cars for us to sit in and test drive, so I can’t speak to the lower trims. In the photo above, everything above the horizontal chrome trimline is mostly nice materials. The leatherette is soft and nicely padded, the button layout is smart and button feel is tactile and tight, and the broader shapes are organic and inputs intuitive. All of the vehicle dials, from the new infotainment roundel and volume knob to the air conditioning controls, all have an identical weight and click, which Mazda claims is one example of its fundamental philosophy of simplifying the relationship between the passengers and the functions of the car for a consistent experience. There’s shiny black plastic with a deep purple-ish 3D detail surrounding the gear selector, leatherette wrapping the steering wheel, and the only truly negative mark is the harder plastic material on just about everything below that chrome accent line I mentioned before. The touch screen has been abandoned entirely on the new car, and the 8.8-inch display screen canted toward the driver is standard on every trim. The menus are easy to navigate with the dial and its surrounding four buttons. There’s also an elegant “favorites” menu that collects your favorite stations, navigation locations, and others in one single list, instead of creating needless additional sub-menus for commonly-clicked features. 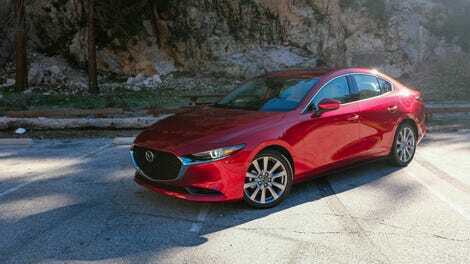 The all-new 2019 Mazda 3, at least the front-wheel drive automatic sedan, is undoubtedly more of an upscale experience over the outgoing car in every regard. We’ll have to wait and see what Mazda has planned for the SkyActiv-X engine, and god willing, a stick and all-wheel drive. Small car and sedan sales may be down as SUVs take over the world, but one reason that’s disappointing is that those small cars are better than ever. Even with some undoubtedly controversial changes to the rear suspension, the new Mazda 3 keeps up with how good things are getting these days. More than that, the 2019 model is a promising preview of the technology, driving experience and design direction for what this more premium Mazda may look like—and it’s mission accomplished, so far. Manual only on the premium hatchback--what happened to accessible Zoom-Zoom? As good as the old one but smoother, quieter, and nicer to look at and be in.